Brighton-based AVT Connect was delighted to produce the prestigious STEP Private Client Awards at The London Hilton on Park Lane’s Wellington Ballroom on Wednesday 19th September. Celebrated television reporter, journalist and author Kate Adie OBE was invited to host the glittering occasion and announce the winners, from over 80 UK and international firms and four industry luminaries, who made this year’s shortlist. Looking glamorous in sequins, Kate, who is a former Chief News Correspondent for the BBC and known for covering conflicts such as the Gulf War, added a highly entertaining element to the celebration – and received rapturous applause from the guests. Attended by a prominent guest list and audience of nearly 700 financiers, the awards are the only international competition to highlight excellence across the private wealth sector and include categories for private client solicitors/attorneys, lawyers, barristers, accountants, private bankers, financial advisors and trust managers. STEP (The Society of Trust and Estate Practitioners) was founded in 1991 and is the leading worldwide professional body for practitioners in the fields of trusts, estates and related issues. The Private Client Awards offer an unrivalled opportunity for these professionals to demonstrate excellence in their field and to their peer group. This was the seventh annual STEP awards and AVT Connect again took great pleasure in producing this celebratory occasion, not least because it offers the opportunity to use a whole range of technical, digital and events expertise for which they are renowned. AVT designed and installed the elaborate stage set and a dynamic lighting display combined with a looped presentation on arrival which showed pictures of the guests as they arrived and displayed sponsors’ logos. In addition, they designed a 120 second upbeat graphic with “dancing” spotlights lights to open the awards. To go with the awards themselves, AVT produced a dynamic presentation in PowerPoint™. On the night, a team of technicians were on hand to manage the audio visual and dual screen set up with music and video relay. The music was well chosen and on several occasions, the audience clapped in time to the beat. AVT’s camera team filmed the entire event, including interviews with judges, sponsors and winners. Together this footage will be edited to produce an essence video of the occasion for use on the STEP awards web site. For the second year STEP’s award charity was Feed the Minds who deliver innovative education projects to help save lives, reduce poverty and transform communities in developing countries. 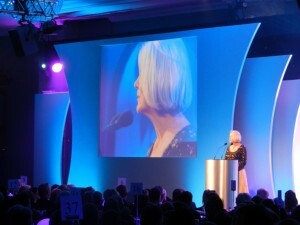 This year’s STEP PCA raised £56,623 for Feed the Minds through contributions by awards entrants. There is no fee for entering the awards. View the full list of winners and photos at www.step.org/awards. All winners will be profiled in STEP’s membership magazine, the STEP Journal, which will be online at www.stepjournal.org in November.